I see a little poster being shared all over facebook all the time telling people to look for a sticker starting with an 8 to warn us that the produce has been genetically modified. 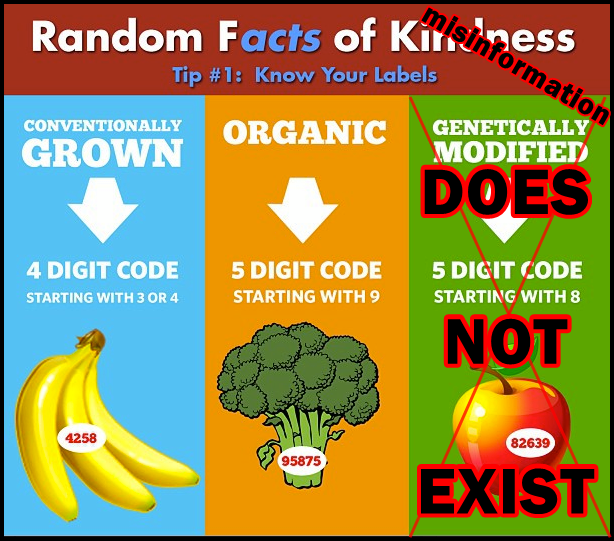 We do not have laws to label GMO foods in North America, so you won’t see a sticker that starts with an 8 here! Not until we get laws to mandate them! The original poster gives people such a false sense of reassurance. If you really can’t afford organic produce, then do the research (links below) and choose non-GMO conventional. There’s evidence linking GMO foods to the rise in gastro-intestinal and other health problems in people, children in particular are more vulnerable. Also, EWG has a handy Guide regarding fruits and veggies with the most and least amount of pesticides to help us choose the safest food we can afford. You can watch the following little video for some good music and a bunch of celebrities who agree we should have proper labels on our food. Some day I might make a list of all the research showing health harm from RoundUp. There are so many causes for concern there that it boggles how it is still legal. Please do yourself and your families a big favor, and don’t eat GMO foods. This act will eliminate so many fast and processed foods from your lives too, which is actually another good thing. Real food is so much better for us. Please care enough to eat real. This entry was posted in Environment, Environmental Health, Food, GMO, Government, Health, Images and tagged allergies, Diet, environmental sensitivities, fruits and veggies, GMO labels, health, images, pesticides in produce, science, unhealthy food, video. Bookmark the permalink.